The Library makes available to island groups a public meeting room consisting of a large conference table and seating. Maximum occupancy is 38 people. The meeting room comes equipped with large tables, chairs, and multimedia equipment. Meetings that are open to the public, free of charge, and without requests for donations may be scheduled by contacting library staff at 360-378-2798. For meetings of this nature, (free, open to the public, etc.) there is no meeting room usage fee. However, the meeting room is also open on a fee basis to organizations (non-profit or for profit) or institutions which charge a fee or tuition or request a donation, subject to approval. When applicable, the fee for use of the meeting room is $50 per meeting. Please download and fill out a 2019 Meeting Room Application form and submit it to the Library. This will be reviewed by staff and you will be contacted regarding the status of your application. Please be aware that this does not constitute a successful booking until confirmed by staff. 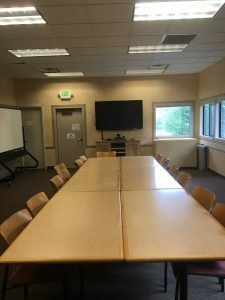 If for some reason the San Juan Island Library is unable to accommodate your meeting room request, there are other community venues available for use. This resource is available courtesy of Tim Dustrude, San Juan Update.